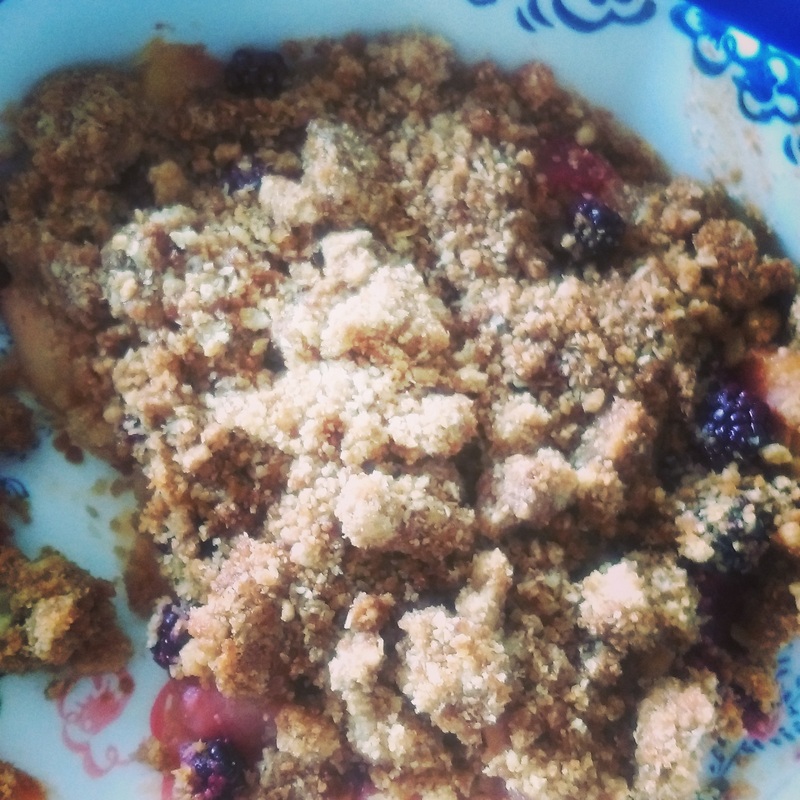 It’s that time of year again, Crumble Season. 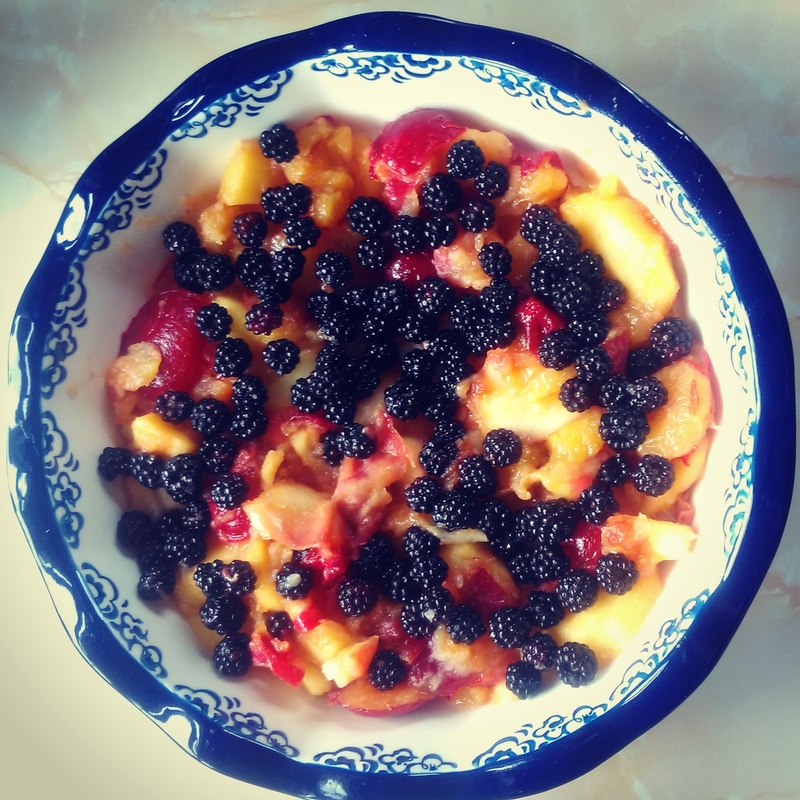 Whilst a fruit crumble is welcome any time of the year, once the blackberries ripen, it’s obligatory! 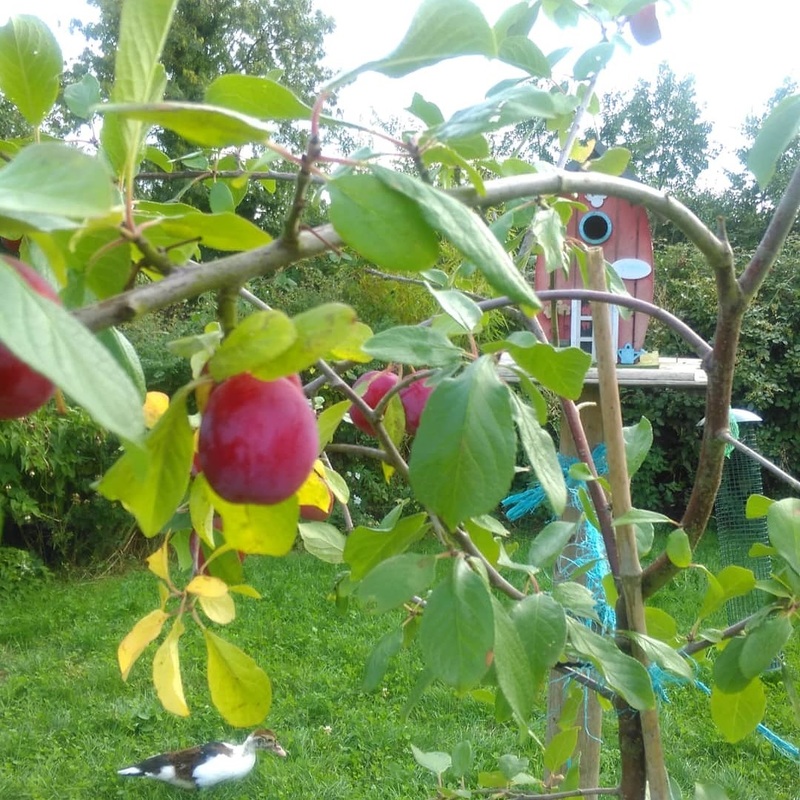 This year, we had a nice little crop of plums, apples, and blackberries; our first crumble with fruits entirely grown in our garden since we moved here two years ago: so very exciting! This is such a great recipe: It can be dairy, gluten and sugar-free and vegan too if you need! 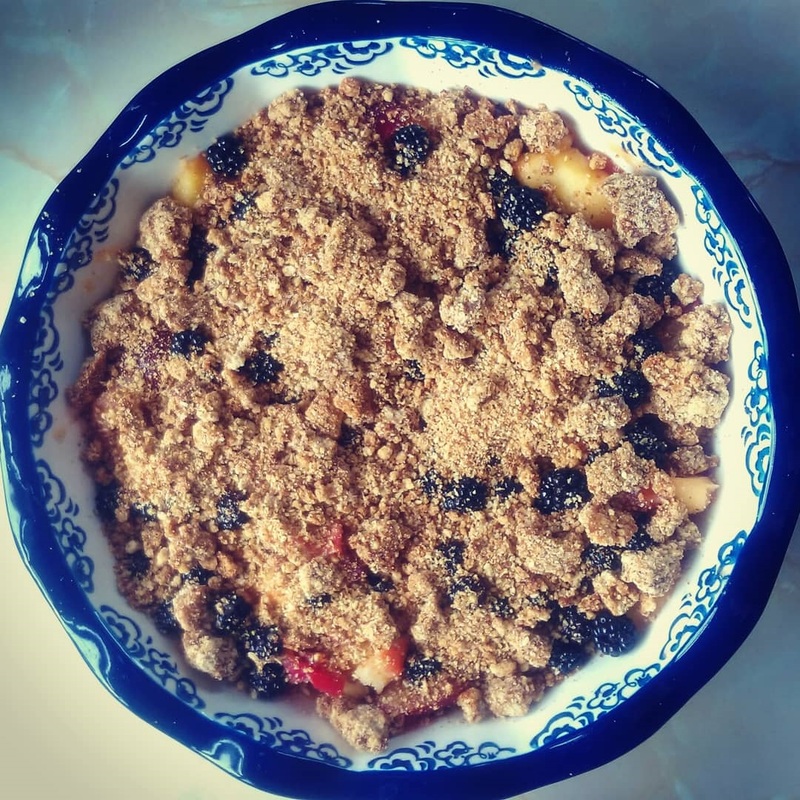 The crumble topping is what Hugh Fearnley-Whittingstall calls an “Independent crumble”, meaning, it’s baked separately and can be frozen for any spontaneous crumble you may feel the need to make (I frequently have these kinds of needs). Also pre-baking the crumble gives you a delicious crisp crumb and retains the texture of your fruit (so it doesn’t all go to mush). And now, without further ado, let us move quickly to the recipe. -100g (raw, odourless) coconut oil (or butter). Gently heat the oil (or butter), then stir it into the flours with a fork, mixing until well combined. Stir in the sugar and salt. If it is too dry, you may need a little more oil or butter, add it by the spoon, you want a crumble mix that is like breadcrumbs, not too greasy. Spread onto a baking tray lined with parchment and bake for 25-30 minutes until lightly golden, stirring around after 15 minutes. Keep an eye on it! You want it just golden so that it will take more baking later on. Remove from the oven and leave it to cool. Meanwhile, prepare your fruit: washing, peeling, and stoning. With harder fruit, like apples, I like to lightly cook the apples first; so I put the diced apple in a saucepan (not the highest setting) with half the sweetener and stir for about three-five minutes. When they start to soften a little, take them off, put them in your dish, add the plums and sprinkle the blackberries on top. Drizzle on the rest of the sweetener, vanilla (and cinnamon if using) and toss gently around. 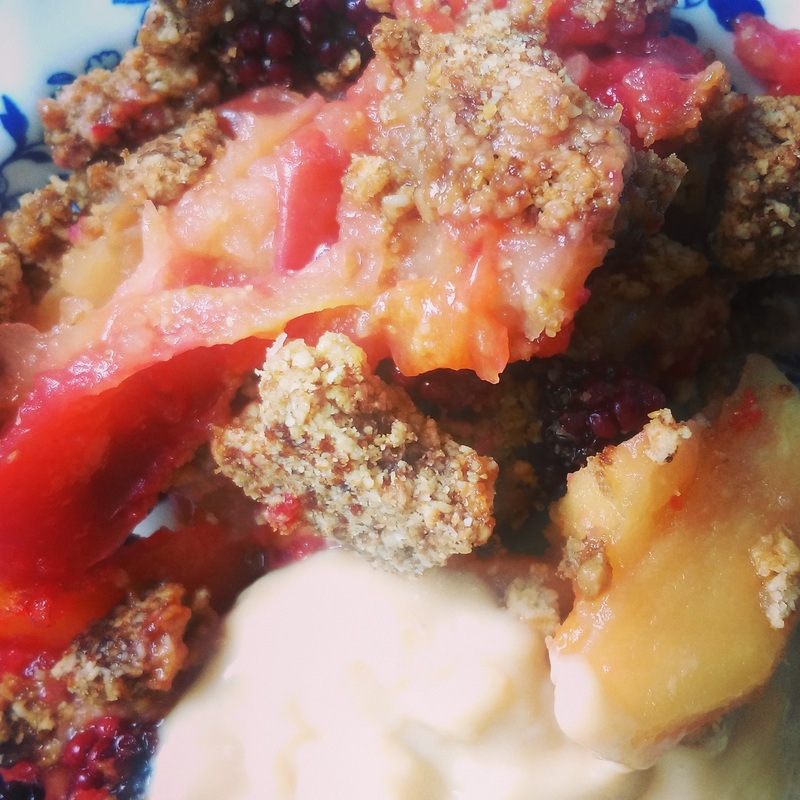 Using half your prepared crumble, spoon it on top of the fruit in a thin, fairly-even layer. I like having fruit showing through the crumble. Then bake in the oven for 20-30 minutes, until the fruit is bubbling and the topping is nicely browned (not burnt!). Leave it for about ten minutes before eating. Serve with custard, cream, ice-cream or on its delicious lonesome! (Makes a particularly lovely breakfast. So says “My Friend” (cough) who ate it thus the following morning).